Add interest to your work when you build with colored clay patterns, also known as nerikomi or neriage! If you’re bored with glazing, working with colored clay is a fun way to get color and pattern onto your pots. In this feature, Faith Rahill walks us step-by-step through the creation of a colored block of clay that she slices and uses as an inlay pattern on a platter. This colored clay process is often called nerikomi or neriage. This is one of those techniques that is simple and straightforward, but requires a lot of attention to detail. Luckily, Faith covers all the bases for us so that we can plan for success. Enjoy! -Jennifer Poellot Harnetty, editor. Nerikomi (often referred to as “neriage”) is a decorative process established in Japan that involves stacking colored clay and then slicing through the cross section to reveal a pattern, which can then be used as an applied decoration. Nerikomi designs provide a wonderful way to work three dimensionally with patterns and images. The results reflect a combination of both careful planning and accidental surprise, plus it’s exciting work for those who love patterns and are drawn to the wet-clay stage of pottery making. My work with colored clay is slow, exacting and fraught with technical challenges. Along with my love of handbuilding, what keeps me hooked on nerikomi is the pleasure of conceiving a design, followed by the creative challenge of building it in cross section. Slicing through a new block that you’ve been working on for the past hour or two has the same exciting quality of unloading a kiln load of new work. Colorants can be added to any white clay. Since I periodically change my mind about the intensities of color, over time percentages can change. Combining two different colors in a test sometimes yields nice results. Ten percent means, for instance, 5 pounds of wet clay mixed with 1/2 pound of dry colorant. The colors in this list are Mason stains. You can also use oxides. Years ago, I bought 5 and 10 pound batches not knowing that it was a lifetime supply. If you choose to fire at lower temperatures, there are more colors available to you, as some colors burn out at higher temperatures. Here’s a list to use as a guideline. To add color, create a well in a preweighed lump of wet clay and spoon the weighed dry material into the well. Add just enough water to make a paste, then slowly mix it together until well blended and wedged. There are hand cream products out there that can help protect your skin. I recommend buying one and applying it before getting to work. I use Kerodex®, which comes from the pharmacist. Two different clays, such as a brown and a white stoneware, can be used together if they shrink compatibly. With all the colorants and clays available, experimentation is a great way to discover what you like and to create your own colors. It also makes opening the kiln more fun. 1–2. For this nerikomi design, slice thin slabs of uncolored and black-colored clay blocks using 4 lb. fishing line. Roll the slabs together from both ends to form a double spiral. Work on plastic or a wet canvas surface to keep everything as wet as possible. To create the center of the block, press two of the double spirals together back to back. 3–4. To create the stripes, stack thin, alternating black and white slabs together. Use 2 lb. fishing line to cut the block in half. Cut each half again to create four sections. Tip: The fishing line is difficult to see on the table. Tie one end of the line to a button so that it’s easier to find when you need it. 5–6. Slam the double-spiral square on the table to make it flat on all sides, then place the stripe blocks against it. Squish the block into a square, forcing the corners to meet, then slam the block again to make it a square. 7–8. Wrap a thin slice of green-colored clay around the block to give it a border, then gently slam it once more to create a good bond. 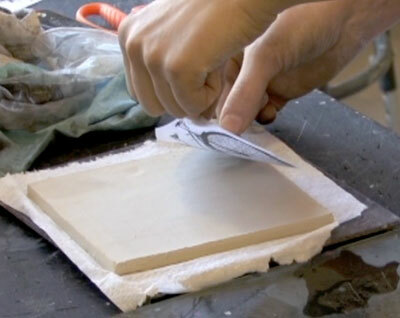 Place the block on a clean, wet canvas surface and slice it with 2 lb. fishing line across the bottom. Use mat-board slats as guides. 9. Carefully peel the slice off of the block. I slice all the pieces I’m going to need for the next day, and store them between wet handiwipes or wet pieces of cloth under plastic. The slices need to be soggy wet all the way through in order for them to roll seamlessly into a slab of clay. 10–11. Arrange the slices on a rolled out slab that is sitting on plastic. To keep the clay from sticking to the rolling pin, use a piece of cloth between the pin and the clay. Slats keep the rolling even. You’ll see a print of the design when you remove the cloth. Note: An important part of my routine consists of washing my cloths out at the end of the day and draping them across my studio. 12–13. Once the surface of the slab seems dry enough that the rolling pin won’t drag the color around, roll without the cloth. Wipe the rolling pin off after each pass, otherwise you might have to sand at the bisque stage to clean up stray colored clay. Use a cardboard template to cut the final shape of the plate. After lifting the edge to form the sides, I cover the piece and allow it to dry slowly on a bat (until there’s lots of lovely black mold under it). Slow drying reduces warping and allows the moisture to equalize among all the combined clays so they dry uniformly. I fire to Cone 10 and use #16 transparent glaze from Laguna, adding silica to reduce crazing. Although I get plenty of seconds using this technique, I love experimentation, and am constantly introducing new clays and other variables. Safety Tip: Working with colored clay requires extra safety measures. 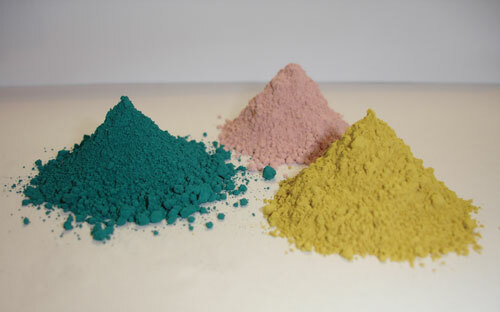 When mixing powdered colorants into wet clay, always use latex or rubber gloves, and wear a respirator. Faith Rahill received her B.F.A. from the University of Oregon in 1973, and has been a studio potter in Eugene, Oregon, for more than 32 years. To see more of her work, visit www.faithrahillpottery.com. bases, clay, crazing, reduce, sand, stoneware, warping. I have tried this and it works. Just be careful that you do not spoil each of the colors with the other one. Fingerprints and bits of clay on your work surfaces stick to your work. Can we use CMC in clay to make it behave smooth and cohesive for better workability?!!!!!! @patti cardinal: Vinegar is a “rheology modifyer;” it changes the way the clay flows. More precisely, it changes the way the clay particles interact with one another and the water around them by lowering the pH. I don’t know exactly what the effect of vinegar is pottery clay, but I suspect that it lowers the viscosity a bit. This would relieve some of the stress at the boundaries and allow the different layers merge more easily. Note that this is a guess by non-expert. There is a huge amount of research on the behavior of clays, but it’s not easy to figure out what is relevant to pottery. Oops, just read Tom”s comment about vinegar. Will try that. But what does vinegar do anyway. I know some people firmly believe in it for joining pieces, but just how is it supposed to help? Like Anne, I have had some luck with this technique and when it is good, it is very good. But too often I get cracks during the GLAZE firing. I have had the same problem at cone 5 and at 06, and I have had it when using the patterned piece as an overlay and when I use the patterned clay as the full wall thickness. I get small cracks where the colors meet the uncolored clay. I too have been using Mason stains as colorants. Is there a way to adjust the base clay body to fit the colored clay body shrinkage without a degree in chemistry? I love this demonstration. Very clear to follow and I’m looking forward to try. Thank you for sharing it with us! I really enjoyed watching the block pattern develop from the coloured components and how they were put together. Can’t wait to play around with it! Darlene – Copper can be volutile at higher temeratures of stoneware and porcelain range. I recommend doing up a little slip for each of your planned colorants and mix them the way you will use them and do a test run in the kiln you will be using. This minimizes the affects of variables that cannot be predicted in other ways and will give you better results. Here is a nice little discussion on about.com about this topic. Anne – try using vinager in the mix instead of water – this may help in the bonding of the separate clay bodies. Otherwise be sure you are using the same clay body for each color – this will assure better bonding as well. Hermoso trabajo, que se puede aplicar de muchas y muy diversas formas!! Perhaps using a clay with a higher ball clay content. That tip originates from Vince Pitelka. Which are the colors that are known to burn out over cone6 so I can avoid those? I also read some colors tend to shrink and crack more but no one has revealed which they are. Any info on failures as well as successes would be appreciated – no sense in us all having to reinvent the wheel. i’ve tried this technique with some success but have found that after the piece that i have laid colored pieces on tend to crack along the seams of the colored pieces, especially after firing it. i rolled the whole thing out to flatten it. used the same white clay. dried it out slowly. still fissures?!?!? any suggestions to avoid this problem? Hi, can anyone tell me the danish term for Mason stains. I would love to try this tecnique out and am in need of the materials. A very interesting article & technique & I am glad you shared it with us clay artists. I love getting these shared ideas & I appreciate the trials the author went through to get to the desired affect. We all know the many challenges when it comesd to trying out new ideas, yet it is an exciting exploration none the less.